Spring II Session registration is open! Session begins April 29. Register now! Online registration for Hooksett town residents opens February 25! If you love your YMCA Child Care experience, spread the word and get rewarded! We provide personal training at all branches for members wanting extra motivation and attention. The Y is more than a gym, it’s a cause that helps bring about lasting personal and social change. It’s an organization committed every day to helping you, your children, and your families learn, grow, and thrive. When you join the Y, you’re committing to more than simply becoming healthier. You are supporting the values and programs that strengthen your community. Join today for more than a workout. Join for a better us. As the leading nonprofit for youth development, healthy living, and social responsibility, the Y is a positive force in the community. We work side by side with volunteers, community members, and our neighbors to create a safe, healthy and caring environment that will nurture people of all ages and backgrounds. Your time and talent as a volunteer helps a child, mentors a teen or provides support for families. 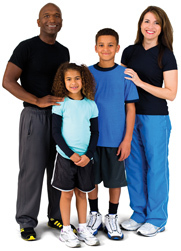 Become a volunteer at the Y today and together, we can create a better us. The Y understands what our community needs to be at its best and provides everyone the opportunity to be healthy and thrive, to connect with others, and contribute to a better community. Everything the Y does is in service of making us – as individuals and a community – better. Each donation is for a better you, for a better community, for a better country. The Y. for a better us. The Granite YMCA creates a community where all are welcome and builds a healthy spirit, mind and body based on the values of caring, honesty, respect, and responsibility. Our Y relies on the generosity of corporate and foundation partners and sponsors to our Annual Reach Out for Youth and Families Campaign. These relationships help The Granite YMCA maintain and expand services to the people who need it most. Together, we can do so much more!